4.1 Where will the Wheelchair User use their Wheelchair? 4.2 What Distance is Travelled per Day in the Wheelchair? 4.3 How Many Hours per Day do they use the Wheelchair? 4.4 Where and How does the Wheelchair User Sit or Lie When Out of their Wheelchair (Posture & Surface)? 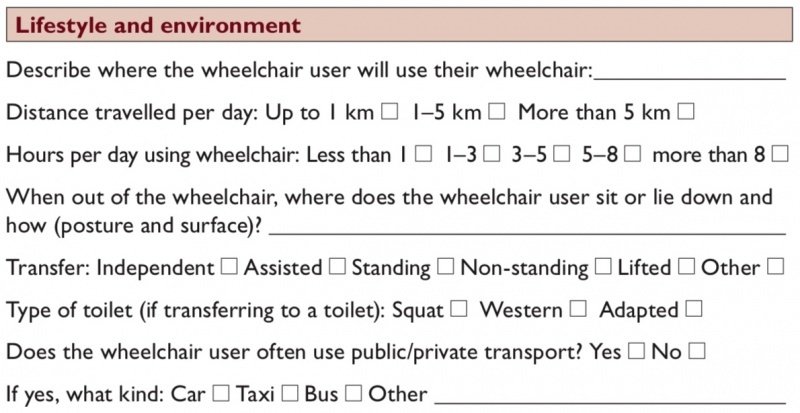 4.5 How does the Wheelchair User Perform their Transfers ? 4.6 What Type of Toilet Do they Use? 4.7 Does the Wheelchair User often use Public/Private Transport? Why did you come to the wheelchair service today? What should your wheelchair help you do? I need to be able to reach the well to collect water. I need to be able to get into a lift to reach my apartment. I need to be able to get my wheelchair into a small car. I would like to be more comfortable when sitting. I would like to be able to sit for longer in my wheelchair before I get tired. I need to be able to get in and out of the wheelchair myself. I need to be able to sit at a desk to use the computer. I would like to be able to visit my family and need a wheelchair that I can take on the bus. Some wheelchair users may have problems with spasticity, which can be triggered in a number of different ways including; the position of the person’s hip, knee and ankle; touch and movement of the wheelchair, particularly over rough/bumpy ground. Find out how the spasticity or uncontrolled movements affect the wheelchair user and problem solve with them in order to develop a wheelchair set up for them that can counteract the affects. Straps may be useful give a wheelchair user increased control over their legs and feet. Straps may be used over the feet to keep the feet on the footrest or at the knees to keep the legs together. Ensure any straps used are fastened with velcro so that it will release if the wheelchair user falls out of the wheelchair. Other supports or adjustments that can be made to cater for spasticity or uncontrolled movements include increased support around the pelvis to support a neutral posture, adjusting the wheelchair seat to backrest angle so that the wheelchair user sits with their hips bent slightly higher than neutral (increased 'dump') an positioning the footrests so that the knees are bent slightly more than 90 degrees, ‘tucking’ the feet in or trying different angles of footrests. Muscle tone is the resistance of muscles to passive stretch or elongation, which is effectively the amount of tension a muscle has at rest. Normal tone should be high enough to resist the effects of gravity in both posture and movement, yet low enough to allow freedom of movement, allowing the limb or joint to be moved freely and easily. However some people may have muscle tone that is too high or too low, which can have an impact on both posture and movement. Problems with muscle tone can be a problem for some wheelchair users and is a common problem for people who have cerebral palsy , brain injury , spinal cord injury , and stroke . High Tone; There is more resistance/tension, so it is harder to move a limb or joint. A person with high muscle tone will usually find it difficult to move the affected limb or joint, and movement may be slow. Some people with high tone can move only in a certain ‘fixed’ pattern. If the muscle tone is very high, almost no movement is possible. Low Tone; There is less resistance, so it is easy to passively move the limb or joint. However, a person with a low muscle tone may find it difficult to initiate movement, and may also find controlling their movement difficult. Low muscle tone is sometimes described as ‘floppy or flaccid’. If the tone is very low, it may be very difficult for the person to move. high and low muscle tone can both be a risk factor for hip dislocations. Poor upright posture can be a common characteristic in those individuals who have fatigue. While they are often able to sit upright, they often cannot maintain this upright posture for long secondary to fatigue, which puts them at an increased risk of developing postural problems or in many cases pressure areas. It is also very common with children who have tight muscles and high tone around the hip and pelvis and tend to always sit or lie with their legs to one side . This can be a problem for people with cerebral palsy  or traumatic brain injury . For children who haven’t walked and have a tendency to lie with both legs to one side (windswept): the hip, which is adducted and internally rotated is the one most likely to dislocate . When children have low tone around the hip joint, they can also be at risk of hip dislocation. This is because the muscles and ligaments are not strong enough to hold the two parts of the hip joint together, the acetabulum and the head of the femur. A dislocated hip is not always painful . it is not possible to fully straighten the hips. When assessing a child or adult who has any of the signs of a possible dislocated hip, move the hips gently and avoid causing pain. If you are not sure if someone has dislocated hips refer them to a doctor or experienced physiotherapist for further advice. check what position the person sleeps in. Advise on a sleeping position that avoids windsweeping of the legs, and the legs from being squeezed tightly against each other. What to do if a wheelchair user has a seizure during a wheelchair assessment: When providing a wheelchair for a person who has epilepsy remember: When a wheelchair user has a minor seizure, wait for it to be over and then continue with the assessment. time the duration of the seizure and give this information to the wheelchair user or his/her caregiver after the seizure (70). the seizure lasts longer than five minutes (70). if a wheelchair user has epilepsy, which is not being treated, refer them to a doctor. Where will the Wheelchair User use their Wheelchair? The wheelchair needs to be practical for the wheelchair user’s home, work or school e.g. a wheelchair user who needs to travel to the market or to work on a rough track needs a wheelchair, which works well on rough terrain. What Distance is Travelled per Day in the Wheelchair? Just as someone may walk if going a short distance, but use a bicycle for longer distances, a wheelchair user may use a wheelchair for shorter distances and a tricycle for longer distances. A tricycle takes less energy to cover the same distance and is faster. How Many Hours per Day do they use the Wheelchair? The longer the wheelchair user sits in the wheelchair, the greater the risk of fatigue or a pressure sore. Think about how much support the wheelchair user needs and whether the cushion provides enough pressure relief and comfort. For any wheelchair user who is ‘active’ in their wheelchair during the day, the wheelchair should be set up to make pushing and other activities as efficient as possible. The position of the wheels is important. It is also important to check that the backrest supports the wheelchair user, but does not restrict freedom of movement of the shoulder blades. Where and How does the Wheelchair User Sit or Lie When Out of their Wheelchair (Posture & Surface)? If a wheelchair user stays in the same position for long periods of time, he or she can become stiff and eventually stuck in that position. It may become impossible to sit comfortably in the wheelchair. It is very important to avoid this situation and provide the wheelchair user with various options of comfortable positions to sit or lie in when not in the wheelchair. Does the wheelchair user always sit or lie in the same position? work out ways in which to support the trunk and limbs to position them in more neutral and comfortable positions. Is the wheelchair user able to change his or her position? if the wheelchair user is not able to change position, there is an increased risk of developing problems with posture or pressure sores. How does the Wheelchair User Perform their Transfers ? When providing additional postural support, check that the wheelchair user can transfer easily. For example, by adding a seat or a cushion with a wedge, it may be more difficult for the wheelchair user to transfer. A change in technique may be needed, or a different PSD selected. What Type of Toilet Do they Use? The type of toilet and physical access to the toilet will affect how easy it is for the wheelchair user to use it. It may not be possible to use the toilet because of the design. For example, most wheelchair users find it very difficult to use squat toilets. By asking about the toilet and where the toilet is, the wheelchair service personnel can offer advice on how to transfer to and from the toilet. Wheelchair service personnel may also offer advice on how to adapt the toilet. Does the Wheelchair User often use Public/Private Transport? removable wheels and folding frame and/or backrest make a wheelchair easier to transport. If using public transport, removable parts can be an advantage, as this makes the wheelchair easier to load. However, removable parts can also be a disadvantage, as parts may become separated and lost or stolen. ↑ 4.0 4.1 Martin,K.,Kaltenmark,T.,Lewallen,A.,Smith,C.,&Yoshida,A. (2007).Clinical characteristics of hypotonia:A survey of pediatric physical and occupational therapists. Pediatric Physical Therapy, 19, 217–226. ↑ 16.0 16.1 Pope, P. (2007). Severe and complex neurological disability: Management of the physical condition. Philadelphia: Elsevier Limited. ↑ Moreau, M. et al. (1979). Natural history of the dislocated hip in spastic cerebral palsy. Developmental Medicine and Child Neurology, 21(6), 749–753. ↑ Knapp, R., & Cortes, H. (2002). Untreated hip dislocation in cerebral palsy. Journal of Pediatric Orthopaedics, 22, 668–671. ↑ Pountney,T., Mandy,A., Green, E., & Gard, P. (2009). Hip subluxation and dislocation in cerebral palsy – a prospective study on the effectiveness of postural management programmes. Physiotherapy Research International, 14(2), 116–127. ↑ Health Centre for Children. (2011). Evidence for practice: Surveillance and management of hip displacement and dislocation in children with neuromotor disorders including cerebral palsy.Vancouver, BC:Tanja Mayson.